The lake at Crow Nest Park in Dewsbury has been graced with a visit from a rather dapper duck. The stunningly plumed Mandarin duck been spotted swimming alongside the park’s Mallards and is proving quite a hit with the visitors. The male Mandarin duck has spectacularly ornate plumage with orange, blue, white and buff feathers. He also has long orange feathers on the side of his face and striking orange ‘sails’ on his back. Mandarin ducks introduced to the UK from China early in the twentieth century have escaped or been released and can be seen in various parts of the country, though not typically around here. According to traditional Chinese culture, Mandarin ducks are believed to be lifelong couples, unlike other species of duck, so they are regarded as a symbol of marital affection and faithfulness.The Crow Nest Park visitor is currently on his own, so he may just be passing through on the lookout for a mate. Interestingly female Mandarin ducks nest in holes in trees, where they look after the ducklings in the nest for a while after hatching and then invite them to launch themselves into mid-air before leading them off to the nearest water. Unlike some other introduced species, the Mandarin duck don’t seem to cause any problems for native ducks so he is more than welcomed by the park staff and Friends of group. If you fancy a trip to the park to feed the ducks – please don’t throw in too much bread. Visit the canal & river trust website for more advice on feeding ducks. I hope you will change the site to reflect this. Hi Simon, thanks for commenting and sharing the guardian news story. I’ve now included a link to the canal & river trust website, this has lots of advice on feeding ducks. What a lovely story. 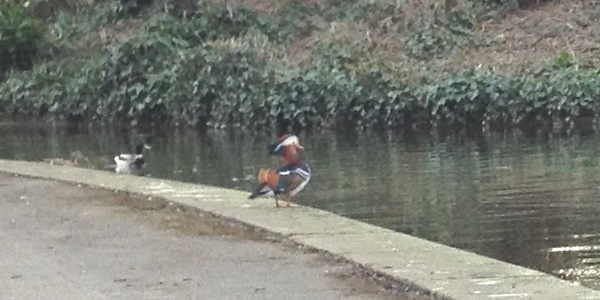 Interestingly, my partner and I saw a pair of Mandarin ducks by the river walk just below Co-Op car park in Holmfirth. This was about 4 weeks ago. We were questioning the breed and thought the pair had escaped from somewhere. If the duck at Crow Nest Park is indeed 1 of the 2 we saw I sincerely hope his partner is alive and well!